At this appointment with Dr. Ouchi, Ke’alohi weighed in at 26 pounds and 4 ounces, measured 31.5 inches long and her head circumference was 19 inches. 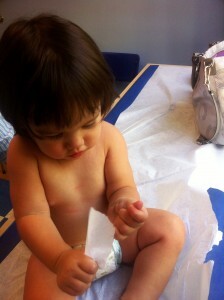 Ke’alohi is now in the 90th percentile for weight and in the 80th percentile for height. She is right on track with her growth! Dr. Ouchi was very happy to hear that Ke’alohi is doing much better with the sippy cups and only really takes bottles before naps and bedtime. She said that we have until she is 2 before we really need to “cut” the habit of using them. She still can’t have any nuts and shellfish but is discovering new foods and snacks everyday. In the next couple months, our goal is to work on her speech and get her to start talking and using words. The shots at this appointment were just as bad as the last ones but this time she did have some reddness and swelling on one of her arms. We will be going back in three months for her eighteen-month appointment where they can check on her growth and give her more shots. What a beautiful, healthy baby!